Hear that? It's a ferry boat bell! And it's calling you down to the shores of the mighty Mississippi River for some unforgettable adventures! The Adventures of Tom Sawyer to be exact. Produced in the fast-paced, abridged One-Hour Classic style, this exciting 75-minute journey is perfect for short commutes, a bedtime story, or as a way to periodically liven up any comprehensive study of this essential American novel. Take an enchanting trip back to the 1840s with Tom, Huck, Injun Joe, Muff Potter, and the rest of the gang from Hannibal, Missouri, and still be home in time for supper! 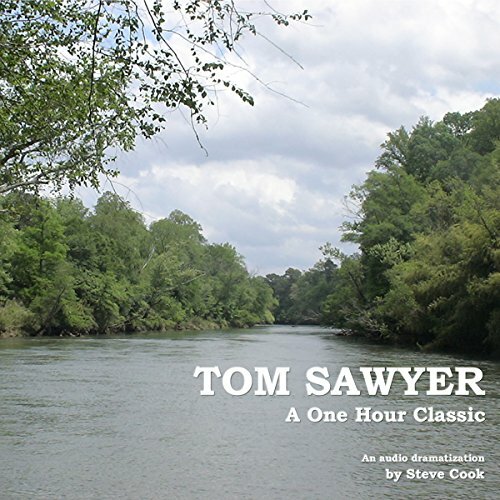 Get introduced (or re-introduced) to a timeless work of great American literature with this truly amazing audio dramatization. Tom Sawyer is a clasic. This is a fabulous performance by Steve Cook. He’s captured the period with lively character voices, voice fluctuations with regards to the moment, accents, and impromptu music to increase attention and momentum of the events. For anyone who wants a snapshot of the adventures of Tom Sawyer, this is a top-notch production! I would LOVE if Mr Cook graced us with more narrations in the classics!